Ed and I were lucky enough to attend this July's annual Wine Bloggers' Conference, held in Buellton, Santa Barbara County, California, home not only to Anderson's fabled pea soup, but also to many fabled wineries. The area has four official appelations--Happy Canyon of Santa Barbara, Santa Maria Valley, Santa Ynez Valley, and the Santa Rita Hills; Buellton is in the Santa Ynez Valley. One of the conference activities was a secret tour of and dinner at one of these wineries in Santa Barbara County. Most of the 300 attendees boarded one of the buses outside the conference hotel, not knowing to which winery they were going. Luckily (again) Ed and I boarded a bus heading to Bien Nacido Vineyards and Winery, in the Santa Maria Valley. Bien Nacido means "well born" in Spanish, harking back to the roots of the vineyard which, in 1837, was part of a Mexican land grant from the then Governor of Alta California. On board was Nicholas Miller, youthful 5th generation owner of Bien Nacido, a branch of whose family has owned the vineyard since 1871. He explained that most of the vineyard's almost 900 acres is Burgundian and Rhone in nature--Chardonnay and Pinot Noir, with some Merlot, Syrah, and Pinot Blanc. Bien Nacido owes much of its exceptional quality to the cool climate from the Pacific Ocean's morning fog and cool afternoons, creating the longest growing season (grape hang time) in California. The result of these favorable growing conditions is that much of the Chardonnay planted in California began as a Bien Nacido Vineyard cutting, and that the Bien Nacido Syrah grape's reputation is unique and notable. Although Bien Nacido has begun making its own wines, most of its vineyards is divided into blocks farmed according to the customers' wishes, customers (over the years), such as Au Bon Climat, Qupe Winery, Foxen, Gary Farrell and Hitching Post. Jim Clendenen of Au Bon Climat and Bob Lindquist of Qupe Winery actually make their wines at the vineyard. Duing a tour of the vineyards overlooking the Santa Maria Valley and a delicious buffet dinner at the original adobe home of the vineyard, we tasted Qupe, Foxen and Hitching Post wines. 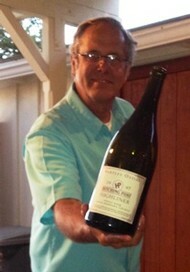 Gray Hartley, co-owner of Ostini Hartley Hitching Post Wines, who poured a great 1997 Hitching Post Highliner Pinot Noir with dinner (photo), has gained some local notoriety from appearing in some scenes of Alexander Payne's Sideways, partially filmed at his Hitching Post Restaurant, in Buellton. 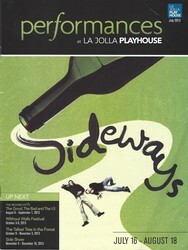 As you may remember, one of my earlier blogs was about our trip to the La Jolla Playhouse to see the play Sideways, also based on the novel of the same name written by Rex Pickett. Look forward to a future blog about the Napa Valley Film Festival's anniversary screening of the film Sideways, along with a Merlot tasting. Merlot has actually regained its popularity since the character Miles in the film criticized it by saying he was not going to drinking any of that .......Merlot. On June 29, Ed and I were back to Hollywood and Vine, at the beautifully-restored art deco Pantages Theater, to see the terrific Ghost The Musical. This stage version was directed by Matthew Warchus, book and lyrics by Bruce Joel Rubin and music and lyrics by Dave Stewart and Glen Ballard. Bruce Joel Rubin adapted the play from his Oscar-winning screenplay Ghost (1990). As you may remember, the plot of the film Ghost (can you believe it's been almost 25 years since it was first released?) revolves around lovers handsome banker Sam Wheat (played by Steven Grant Douglas--the late Patrick Swayze in the film) and sweet sculptor Molly Jensen (played by Katie Postotnik--Demi Moore in the film). Sam and Molly are attacked on the way back from her art show, and he dies and becomes a spirit caught between two worlds. Sam convinces the psychic Oda Mae Brown (played by Carla R. Stewart -- Whoopie Goldberg in the film--a part for which she won an Oscar) to warn Molly that her life is still in danger from their (so-called) friend, Sam's co-worker Carl Bruner (played by Robby Haltiwanger). Carl was responsible for Sam's death, as Carl hired someone to commit the attack to steal information from Sam to further a scam Carl has initiated. The special effects and illusions created by Paul Kieve were amazing, and we were also not disappointed in the new portrayals by the actors, who had wonderful stage presence and marvelous voices; when Sam sang "Unchained Melody" to Molly, there wasn't a dry eye in the house. On Saint Patrick’s Day, Ed and I navigated our way through all the street closures for the Los Angeles Marathon to see Catch Me If You Can--The Musical, at the Pantages Theater, in Hollywood, near the intersection of Hollywood and Vine. Needless to say, Hollywood was flooded with those wearing green – and green beer! 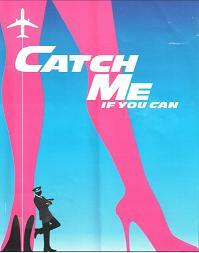 Catch Me If You Can – The Musical is an adaptation of the Dreamworks motion picture, starring Leonardo DiCaprio, as Frank Abagnale, Jr., the real life person on whom the film and musical, as well as the original book (by Abagnale with Stan Redding), was based. The music, lyrics and dancing were all delightful. For those of you who didn’t see the movie, the plot revolves around how a sixteen year old boy, Frank Abagnale, Jr., (played extremely well by the talented Steven Anthony), leaves home and makes it in the real world by impersonating an airline pilot, lawyer and doctor, forging checks and ID’s, and charming the world. The print ad for the movie says it all: "If you wanna make it, make it up." Eventually, when Abagnale is eighteen, the law catches up with him via a zealous FBI agent (played by Merritt David Janes in the musical and played by Tom Hanks in the film). Abagnale serves seven years in prison and then, amazingly, is hired by the FBI to help it fight fraud and embezzlement. Currently, Abagnale is one of the world’s leading authorities on secure documents. When Ed was CEO of Experian Interactive, we met Abagnale a couple of times as he is a world-renowned public speaker on the topics of check fraud, embezzlement and secure documents. Meeting him in person motivated us to see the musical. We weren’t disappointed!